I'm making seagull beads today and I thought I would take a moment to explain the process of how they are made. The process is called Lampworking or Flameworking. All of my beads are handcrafted one at a time in a very hot flame. This is my torch, It's a Carlisle Mini CC. 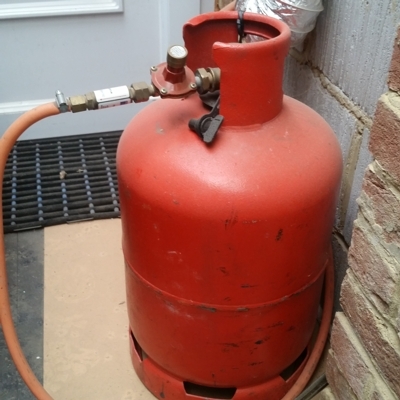 The torch runs on Propane, like you use to run your barbecue. This is my tank. 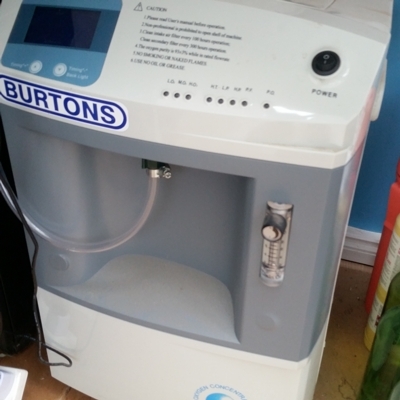 The oxygen is supplied with an oxygen concentrator. The same as would be used in a hospital to provide ixygen to patients. Mine is a 10L model which I purchased from a pet supply company. 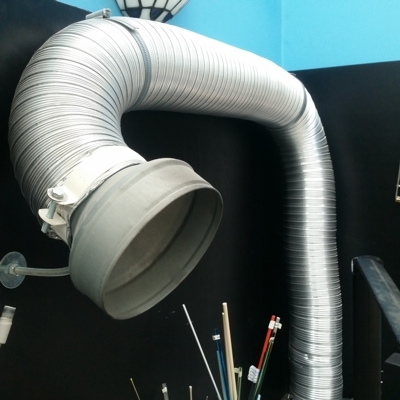 When using the torch some nasty fumes can be released from the chemicals used in colouring the glass so I have to have adequate ventilation so that I don't breathe them in. I have to wear a pair of glasses called Didymiums or didy's for short. These stop the glare of the flame from hurting my eyes. I also have to wear reading glasses at the same time. 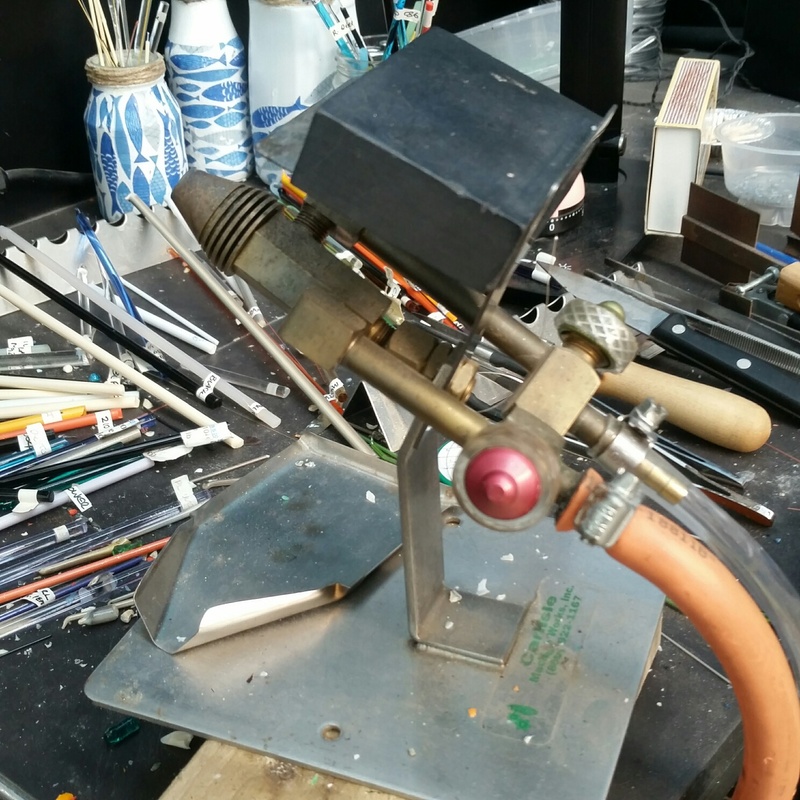 The glass beads are made on stainless steel mandrels otherwise known as welding rods. 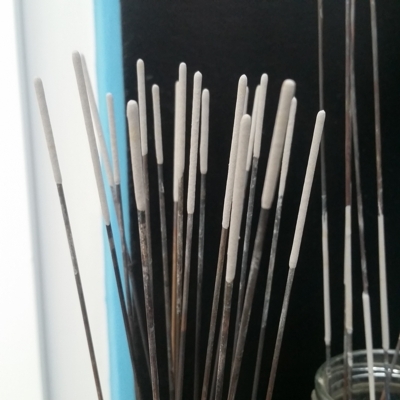 These are coated with a specially formulated bead realease, like clay slip which stops the glass from sticking to the mandrel. 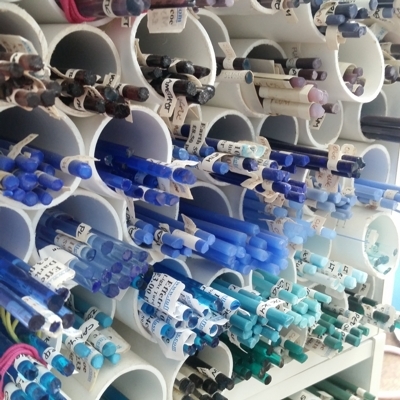 The glass comes in rod form, some of which is produced on the island of Murano in Venice, Italy - yes, the famous bead making island of Murano. This is just a small selection of my collection of glass. 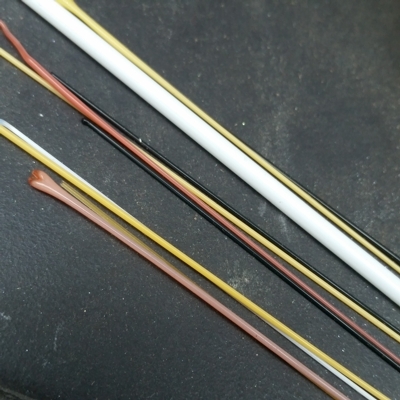 The beads are made by melting the glass rods in the flame and then applying the glass to the mandrel. 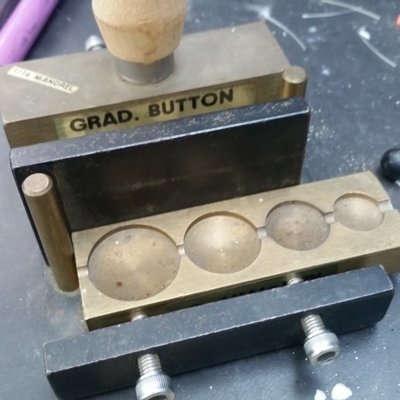 Once enough glass has been built up I use a tool such as this brass press to shape the bead. I hav emany different shaped presses to create all the different shapes of beads that I make. Once the base bead is made, I use stringers to create the seagull design on the front. Stringers are made by melting the end of a rod of glass and then pulling with a pair of tweezers. Depending on how hot the glass is when you pull, you can get different thicknesses of stringer. These are used to 'draw' the design onto the bead in the flame. This can be tricky to do as if you put the stringers in the wrong part of the flame they will ball up and you can't draw with them. Once the beads have been made, they have to go into a kiln to anneal. 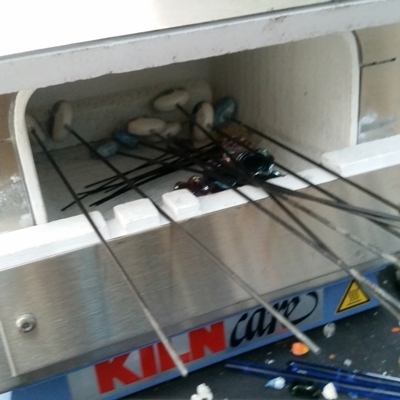 The beads sit in the kiln until the beadmaking session is finished. This is called garaging. 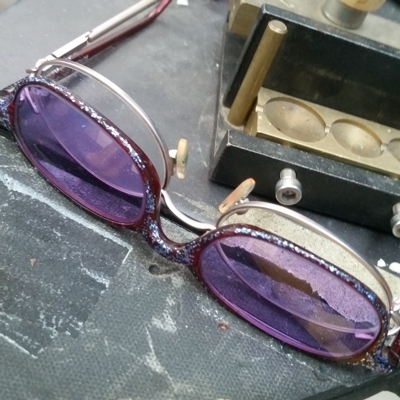 Then the beads are soaked at a set temperature for a set amount of time to reduce the stress that has been created in the glass when the bead was made. Once the annealing process has completed the kiln cools down at a slow rate to prevent the beads from cracking. 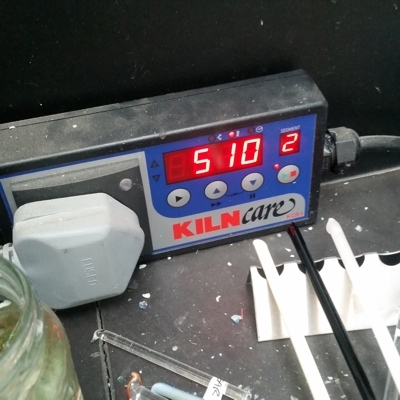 This is the controller of the kiln where I can set the annealing programme. Here you can see some beads in the kiln. Once the kiln has cooled down, this takes a few hours then the beads can be taken out. They get a soak in a jar of water to soften the bead release and then the beads are taken off the mandrel and soaked in water for a while to soften the bead release inside the hole of the bead. Finally they are cleaned with a diamond bead reamer in my dremel. I like my beads to look like seaglass so they are etched using a chemical - but that is a post for another day. 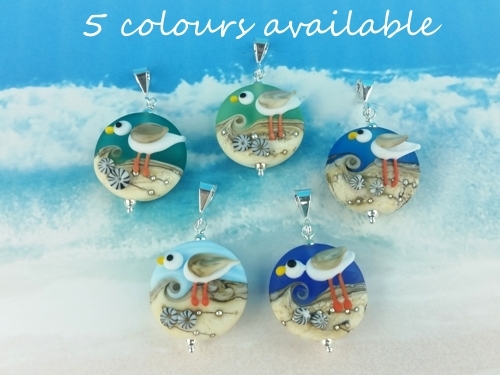 Here are some of my finished seagull beads made up into pendants and are available for sale in my store. 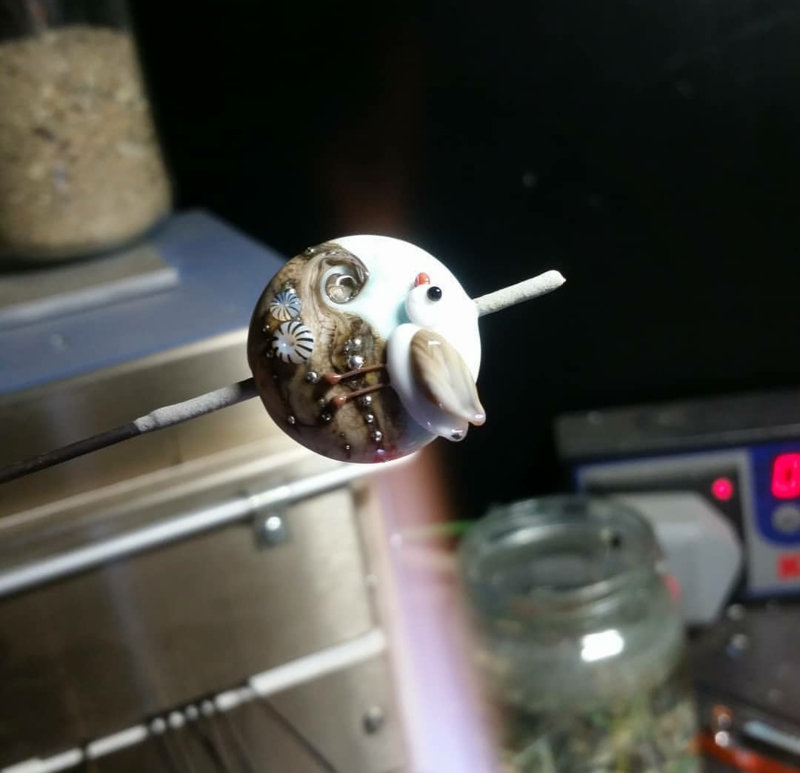 I hope you enjoyed my post and can appreciate all that goes into making these beads - not to mention all the trainings and years of practice.